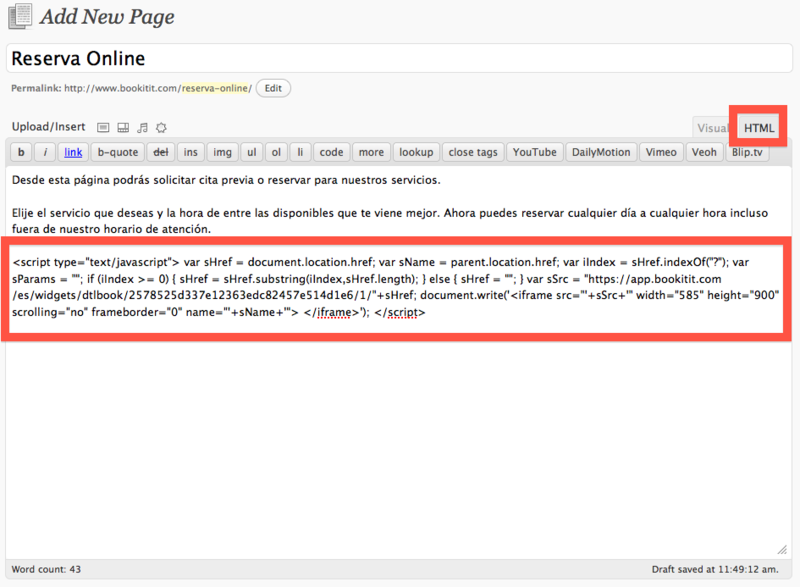 How to integrate the Bookitit's widget on Wordpress? How to integrate the Bookitit’s widget on WordPress? 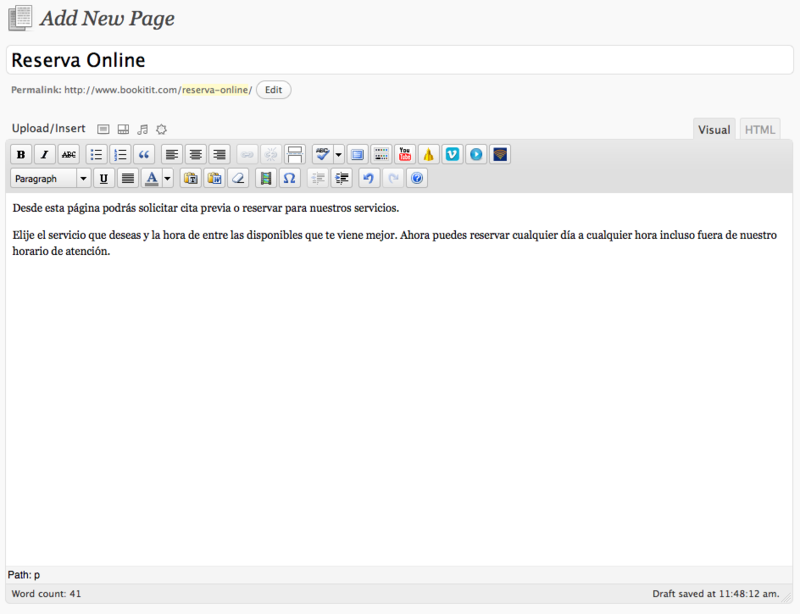 The first thing you have to do is enter into WordPress admin panel and create a new page. On this page you can call the example “online booking” or “Appointment”. You can make a short description for your customers know how they need to make reservations online or by appointment from your site with online booking engine and appointment of Bookitit. You can also integrate bookitit on your wordpress website in a very simple way each and every page of your website so that it is always visible. 1. Now that you’ve created a new page and have named “Online Reservations” or “Appointment” need to log in to your account Bookitit. In the Integration section you will see this screen, as we show in the following image. To copy the link to integrate the widget online reservations online appointment prior to your wordpress page. 2. Now you must return to your website wordpress and paste the link to the page you called “Online Reservations” or “Appointment” having previously selected the HTML option. As shown in the picture. 3. Once pasted the code , just save the page and you will be on your wordpress website a new online channel where your customers can make online reservations for your services or make an appointment online . Here ‘s an example of how it will look your online booking system and appointment of bookitit into your wordpress. Now, all changes you make from your account bookitit be updated automatically in your wordpress website. In the same way that your online booking calendar bookitit be automatically updated every time one of your customers come into your wordpress website and request an appointment.